Closed since December 2016, Parque Radical, the site of the Rio 2016 Olympics BMX and canoeing competitions, is now open to the public on Sundays from 9AM to 4PM. RIO DE JANEIRO, BRAZIL – Welcome news for residents of Rio’s Zona Norte and Zona Oeste (North and West Zone) this past weekend as one of the Rio 2016 Games’ main competition venues, Parque Radical in Deodoro, reopened to the public after being closed for almost nine months. Rio Mayor Marcelo Crivella at the reopening ceremony for Parque Radical in Deodoro, photo courtesy of Prefeitura do Rio de Janeiro. At the park’s reopening ceremony last week, city officials stated that, for now, the park will open to the public on Sundays from 9AM to 4PM. During the week, the site will be used for training, specifically BMX and canoeing athletes preparing for the Tokyo Olympics in 2020. By December, officials anticipate being able to expand the open public days from Wednesdays to Sundays. Parque Radical first opened to the public in December 2015. It was then closed for the Games where it was used for canoe slalom and BMX competitions. The park reopened to the public in September 2016, but was promptly closed again in December 2016 when the company managing the park closed operations. 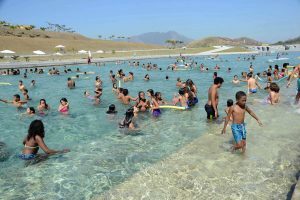 With a capacity of three thousand people, Parque Radical features an artificial lake with three depth levels, photo courtesy of Prefeitura do Rio de Janeiro. With 500,000 square meters of leisure space and a capacity of three thousand people, the Parque Radical is the second largest leisure area in Rio de Janeiro behind only Aterro do Flamengo. Its main feature is a huge artificial lake that has three depth levels (2 meters, 1.20 meters, and 0.45 meters). The park also has a multitude of rest areas, replete with tables and lounge chairs, showers, and playground areas. According to city officials, the park will be under 24-hour surveillance and, when it is open to the public, will be patrolled by both city and military police, in addition to the lifeguards who will be on duty at the artificial lake. “The City today sealed a definitive agreement with the surrounding communities and the Olympians,” said an emotional Secretary of Sports and Leisure, Patricia Amorim, who also attended the reopening ceremony.